Today’s post will be fast and dirty, because my brother-in-law Steve requested this recipe and I leave tomorrow morning for Portland, Oregon. We served this mac and cheese to Steve and his family a few days ago. I made a lot and took notes. This dish makes frequent appearances on our dinner table, but I plan to make it for the entire varsity soccer team later this month, so I was experimenting with quantity. There are those who lean toward the “noodles + cheese and that’s it” style; others swear by copious amounts of cream; some even sneak in an egg yolk or two. I belong to the mornay camp. Mornay sauce is bechamel plus cheese. Bechamel is the classic white sauce, the basis of an array of dishes. You start with melted butter with an equal amount of flour whisked in (the roux), then add warm milk. The standard formula is 1 tablespoon each of butter and flour per cup of milk; use more butter/flour (roux) for a thicker sauce, less for a thinner one. Cheddar, preferably extra-sharp cheddar, is the big cheese, so to speak. I like to add a little of a second (or even third) cheese for complexity. Monterey jack adds creaminess, parmesan contributes a sharp saltiness, and gorgonzola (just a little) adds a little something that’s hard to place but deepens the flavor. Whole grain pasta is the way to go, as far as I’m concerned. It has a welcome nuttiness and firm texture. If you’re not a fan use regular pasta, but think shapes, not sticks; short pasta holds up much better than spaghetti. Panko, Japanese breadcrumbs, are neutrally flavored but fantastically crunchy. Toss them with a little oil to aid browning. No cooking for the next week; I’ll be touring Portland, Oregon with my sisters. I can’t wait. Heat oven to 375 degrees F. Butter a 9 x 13-inch baking dish. Cook pasta in boiling salted water in a large stockpot until 1 minute short of done; it should be almost cooked through but just a little too chewy. Drain, pour back into the stockpot, and set aside. Heat the milk and stock in the microwave until warm, not hot. In a large saucepan, melt butter over medium heat. Add the onion, garlic, and seasonings; cook for 2 minutes until the onion is softened. Add the flour and cook for a minute or two. Whisk in the warmed milk and stock. Cook, stirring often, until thickened, about 5 minutes. (This, by the way, is a bechamel sauce.) The sauce should be on the thin side; the starch from the pasta will thicken it as it bakes. Take the sauce off heat and gradually stir in the cheddar, 1/2 cup of the parmesan, and gorgonzola if using. Taste and adjust seasoning. Pour the sauce over the drained pasta and stir to combine. Pour into the buttered baking dish. In a small bowl, drizzle the oil over the panko. Stir with your fingers until the oil is well distributed. Season to taste with salt and pepper; stir in the parmesan. 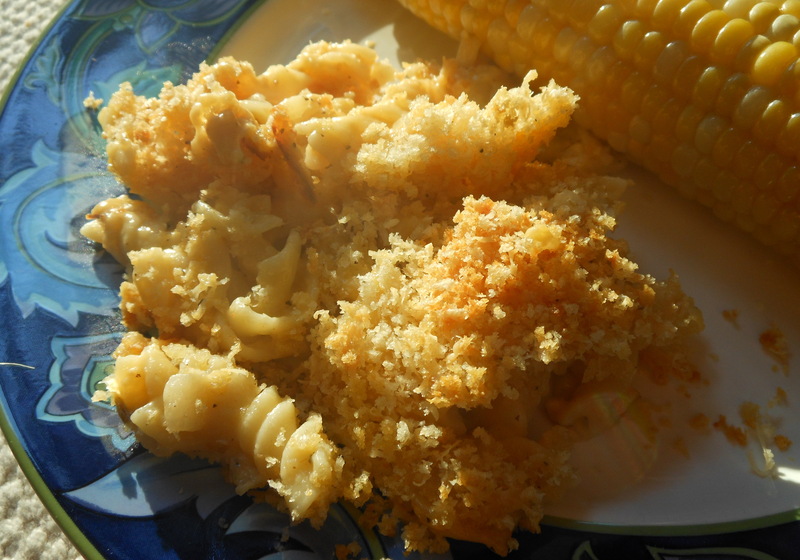 Sprinkle the panko mixture over the mac and cheese and bake for about 30 minutes until the pasta’s bubbly and the topping is browned and crisp. This entry was posted in main courses, pasta, rice, and grains and tagged casseroles, cheddar, cheese, easy, noodles, panko, parmesan, pasta, vegetarian. Bookmark the permalink. There was no gorgonzola in the version I made for you. Let me know what you think–did I get the recipe right?